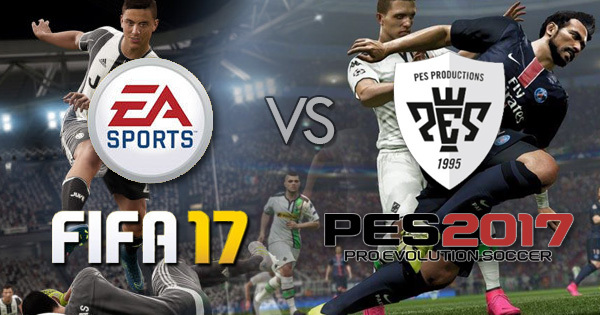 Home » FIFA 17 » PES 2017 » FIFA 17 vs PES 2017 : Who's the Champions? The new version of the football game FIFA 17 and Pro Evolution Soccer 2017 (PES 2017) has been released. Which one is best? let me bring to you what people say about this game. EA Sports has enhanced graphics for this year's version by using the Frostbite Engine. That is the graphics engine used by Battlefield 4, Battlefield 1 and Star Wars: Battlefront. 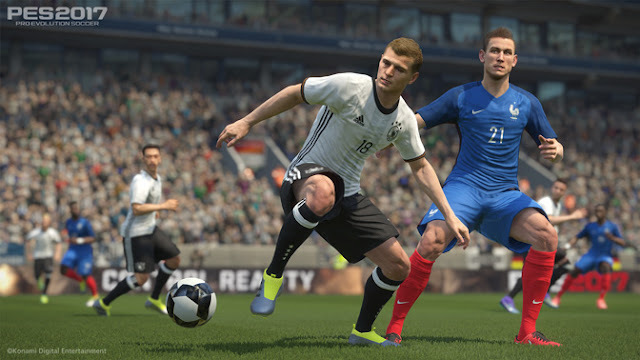 That mean graphic on FIFA 17 to be more realistic in terms of animation, facial and motion. You will also experience more better lighting. While PES 2017 using the FOX engine, the same graphics engine used by Metal Gear Solid 5: The Phantom Pain. This year we've seen the stadium remodel; better lighting, especially at night; rain very well; the public and the response can be selected more active. Player model is also improved, with Ozil and Giroud particularly interesting similarities. For FIFA 17 there are good presentation here. You feel as if every game has its own story. stadium smaller and lower-level events not feel like a game of the Premier League title. The commentary excellent with content that is relevant in every game mode of FIFA. PES‘ commentary is sub standard. There are tons of repeated lines, there is no real difference in the dialogue of the league to a league or match different levels of importance. Quality visual presentation is limited to pre-match UEFA rolls during the event. Based on the flash level and the means we see another sports game, which is much lower compared. Major changes brought in FIFA 17 is 'The Journey'. Where you will play the character of Alex Hunter to become a professional football player and a star. With this new mode, it certainly gives FIFA 17 one of the advantages. For PES 2017 modes, nothing much has changed in the Master League, it's what you feel before. Transfer system has been modified a bit though, because he now has a separate budget for transfers and wages make financial headache easier to manage. Plus, players can be signed on loan for six months, where you can try and test them in your squad before signing them long-term. 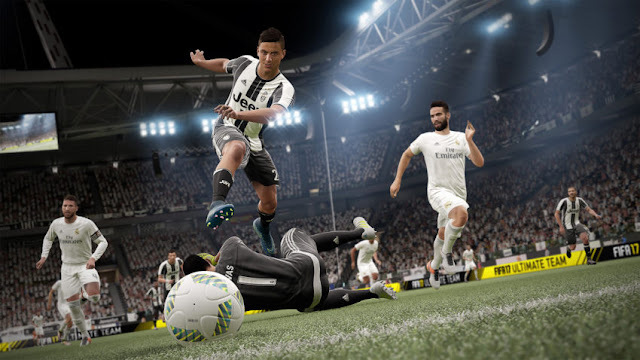 EA Sports focused on improving the FIFA 17 gameplay in a variety of key areas, from improving the AI, creating set-pieces, increase attack techniques and give you a better ball control. In set pieces, you were in control of exactly how the player approaches the ball for the first time, with the ability to change the camera angle. With a free kick, the camera is now sitting behind the player, which allows you to see the actual trajectory of your ball into the goal hoof. For a corner, things have gotten a lot more complex - whether good or bad is up to you - with the reticle to enable you to guide the ball to the zone the penalty is more cautious and the option to switch to the receiver before you kick so you know your players are in the right place. What we like about overhaul the physical game is that you can now urge the opponent, protect the ball better while you dribble and is expected to make sure you control the ball longer. You can now bring the ball to the feet of a header, which is something missing from all previous FIFA titles. But there are also major improvements made to the AI to consider. Suddenly you will find your computer-controlled teammates better use of space on the field, moving out into the wider space and also dragged the defense out of position so you can make better passes. Such as FIFA 17, there are a lot of new gameplay features that come to PES 2017 and perhaps the most important - or at least the most requested - is an improvement to the goal keeper. Suddenly the goalkeeper could some fantastic feats, all of which are on an individual basis. That means Tottenham Hugo Lloris is like aerially gifted as he is in the real world, while Bayern Munich Neuer Manual are all good feet and strong hands. Suddenly the goalkeeper could some fantastic feats, all of which are on an individual basis. That means Tottenham Hugo Lloris is like aerially gifted as he is in the real world, while Bayern Munich Manual Neuer are all good feet and strong hands. Furthermore, they will all come to a corner kick when you make a super attack tactics, just like they used to. Konami also listen to the fans and make the game less arcade-like, with a focus on ball physics and player touches the two combine to make you feel like you control your real team, something that are missing on FIFA 17. Finally, statistical attributes and position to play their role to make sure the players excel in certain areas and weaker in others. Then you have the new defense tactics that you mapped to the d-pad to use the advanced settings Command, consisting of Tika-Taka Barcelona has to Jürgen Klopp Gegenpressing in defense. PES 2017 also features a new game called Adaptive AI, which actually seems to make a difference is very subtle yet noticeable. This means that the opposing team in PES 2017 will watch the moves you make and adjust their defense accordingly. Overuse of any player or the route is too much and the defense will shift to compensate. It's certainly going to force you to change up your game. FIFA 16 was more arcade-like, less tactical and precise on collisions. Although the gap has closed significantly, PES 2017 still has a slight advantage in the game over FIFA 17. 0 Komen untuk "FIFA 17 vs PES 2017 : Who's the Champions?"